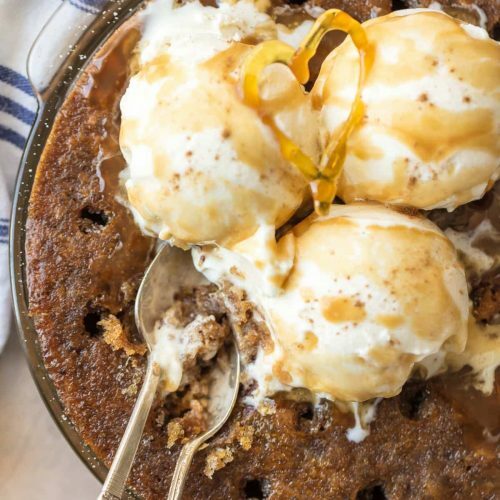 STICKY TOFFEE PUDDING CAKE is the ultimate holiday dessert! This toffee pudding poke cake is the perfect dessert recipe for spoiling your family this Christmas. Top it off with whipped cream or ice cream for an extra special treat! Large saucepan of boiling water. Preheat oven to 350F and adjust oven rack to middle position. Grease and flour an 8-inch square or round baking dish. Line a large & deep oven pan with a clean dishtowel then place the baking dish on top of the towel. Bring a large, covered saucepan of water to boil while preparing the cake batter. Place half the dates in a medium bowl and cover with ¾ cup warm water. Add baking soda, stir, cover the dates and soak them for 5 minutes. Drain dates over another bowl (to reserve the water). In another medium bowl, whisk together flour, baking powder and salt. Using a food processor fitted with the metal blade, process the dates and brown sugar until just blended (10 1-second pulses). Add reserved soaking liquid, eggs and vanilla and process 5 seconds or until smooth. While the food processor is running, pour the melted butter in and process for 3 seconds. Transfer this mixture to the softened dates. Add the dry ingredients to wet and mix just until mixtures blend. Pour the batter into the prepared baking dish and very carefully pour the boiling water halfway up the sides of the baking dish. Do not get any of the boiling water in the batter. Cover the large pan, which includes the baking dish, tightly with aluminum foil. Bake 40-45 minutes or until the outer 2 inches of the cake develops small holes and the center is firm to the touch. **While cake is baking, make the toffee sauce (see below) and keep it warm until cake is baked. Immediately (and very carefully) remove baking dish from water bath and set on wire rack. Poke several small holes through the top of the toffee pudding (cake). Pour all except 1/3 cup warm sauce evenly over the toffee pudding. Cool for 10 minutes, cut and serve with whipped cream or ice cream and drizzle with extra sauce. The cake can be covered and served later. Reheat cake in a preheated 350F oven for 10-15 minutes before serving. Sticky Toffee Pudding will keep, covered, up to 3 days and can be frozen up to 6 months. In a medium saucepan over low-medium heat, melt butter. Whisk in brown sugar and whisk until butter and brown sugar fully incorporate. Cook, whisking occasionally, until mixture looks puffy and sugar is dissolved (3-4 minutes). Remove from heat and slowly, while quickly whisking, add cream and rum. Continue to whisk until mixture comes together. Place pan on stovetop, over low heat, and simmer until frothy, about 3 minutes. Whisk occasionally. Remove from heat and stir in lemon juice. Cover pan with paper towel and with the lid (be sure heat is off). Set sauce aside until ready to use.